If I told you this hotel had been floated across the North Sea from Amsterdam to London’s Royal Victoria Dock you’d think I was joking, right? Well. It was. Back in 2016 following a stint in its home of Amsterdam and a redesign at a shipyard, it made its way on a submerged barge to be docked here. 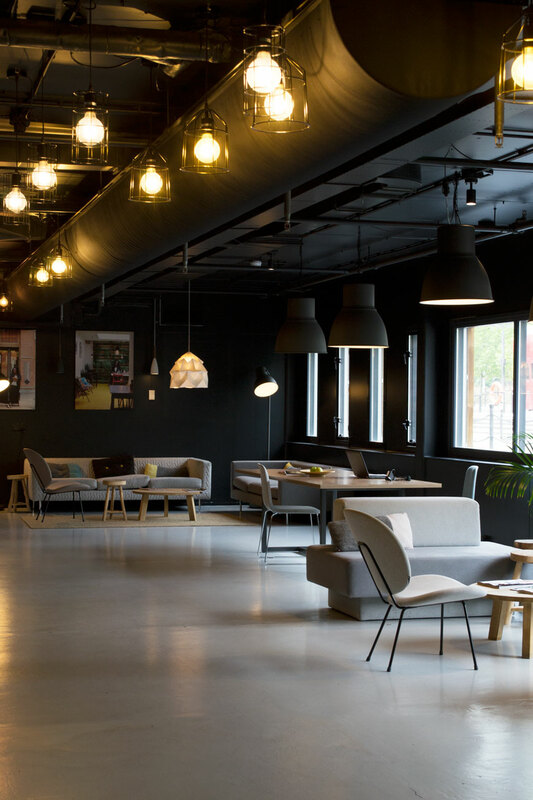 Good Hotel is a new hotel experience founded upon social enterprise by Marten Dresen. Offering hospitality training to previously unemployed locals through their Good Training program, the hotel guides recruits through a three-month residency before helping them secure employment within the industry. During its stay in London, Good Hotel supports local businesses and sources local ingredients, investing the profits back into educating children from low-income families in Antigua, Guatemala. Designed by Remko Verhaagen and Art Director Sikko Valk of studio Blooey who focus on social and ecological projects, it’s hard to believe this structure started life as a detention centre. In my mind, it is quintessentially Dutch. From its altruism to contemporary industrial interiors and relaxed atmosphere. It offers simplistic luxury and a different perspective of London, being that little bit further out from the centre. Soft light wakes you up to waterfront views across the dock. There are four types of room at Good Hotel London, starting with a standard double at £98 a night up to the corner waterview room at £135 upwards. We stayed in the deluxe waterview room with wall to wall kingsize bed, inspired by the traditional Dutch bedstee. It’s certainly cosy, but the minimalist design and full-size window onto the water makes it feel spacious. The room includes custom built shelving and desk also designed by Verhaagen, a full-length mirror and stand-up en-suite shower with FAIR CosmEthics toiletries. There are iconic swing arm lights mounted on the walls and a nifty hidden phone charger in the windowsill. You won’t find TVs in the bedrooms and that’s a deliberate decision, encouraging guests to use the Living Room or to venture up to The Roof to drink in the view. Quite literally. Industrial Dutch style gives a feeling of pared-back luxury. The shared spaces are open plan to connect guests and staff together, the result of which is more homely. Seating and dining areas are cleverly zoned using steel framed wood screening so that even when you’re lounging on one of the minimal sofas, you can still see through to the bar or across the water. Shelves filled with books and magazines encourage you to stop and sit. The cool, industrial structure of metal and polished concrete is warmed with contrasting wooden tables and sisal rugs. 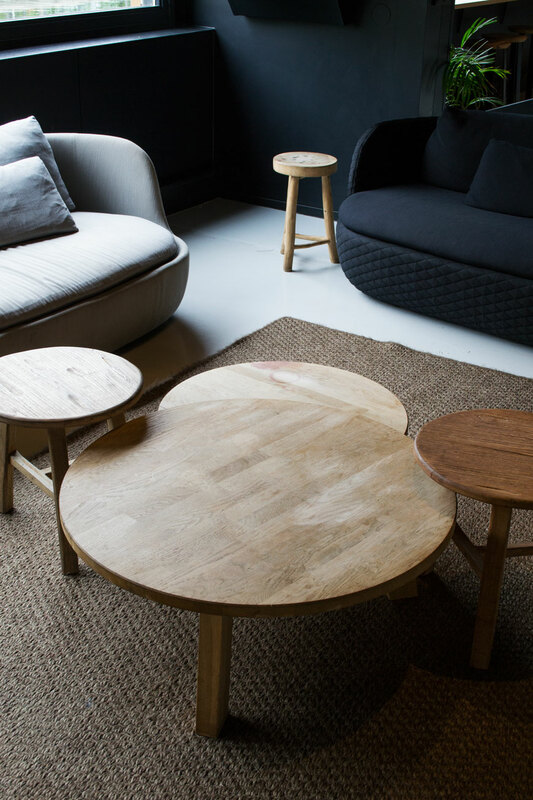 Along with custom pieces designed by Blooey, furniture from Lensvelt and Moooi sit alongside everyday items from HEMA. This is a pared-back interior where the luxury is in the honest materials and feeling of space. The Living Room bar is equipt for day and night, open 24/7. Warm, natural textures of wood and sisal against the minimalist sofas. Sleek and industrial wood screening zones the social spaces. Unlike hotels where it’s policy for staff to blend into the surroundings, here their portraits hang on the walls, sharing their personal journeys as part of the Good Hotel. Staff will happily engage in conversation, telling you about the history of the hotel and perhaps a little of their own experiences. The positive impact that the hotel has on the area is clear. Communal tables for work, meeting or just sitting back to gaze out at the river. It wasn’t the sunniest day during our visit, but you can get a real sense of the area from The Roof bar. The Emirates cable car is right next door drawing your eye over to the O2 Arena on the Greenwich Peninsula. Planes from City Airport jet over every ten minutes (you quickly acclimatise to this and they stop later in the evening) and there are more eateries up towards the Excel, though quite frankly with food this good here, you shouldn’t need to leave. Ever. As if I need to persuade you any further, I think the Dutch have home from home hospitality nailed. I just wish all hotels would follow this model. A place with style and heart. The Good Hotel will be docked here until 2021 when it will make its way on to a new home. Want more inspiration? Check out this London getaway. Good Hotel, Western Gateway, Royal Victoria Dock, London, E16 1FA.